The part 2 is live now. If that is what you are looking after then click here to read the 2nd part. Whenever anyone plans on transiting from Windows to Linux, the first Linux distro that everyone recommends is the Ubuntu LTS and for a good reason, that it is very easy to use than most of the other distros out there. But most new Linux users come to Linux with an impression that Linux is highly customizable. Though it is true for Linux, but Ubuntu with it's Unity Interface is beautiful but it is not that customizable out of the box. And you need to do some changes to customize it beyond just changing the wallpaper. So without further waiting lets skip right on to the steps. Ubuntu tweak is an awesome tool that as the name suggests is used to tweak the settings in Ubuntu. It can be used for a lot of stuff, but here we will just use it to change themes, fonts and some other minor tweaks. So to install it, head over to http://ubuntu-tweak.com/ and just click the "Download Now" button on the page. It will download a .deb file and after it is finished downloading, just run that file and let it install. Now since it is installed we shall continue to our next step. So yeah, now we are there, the step which is the most fun part, at least for me. Now you have to search for some themes that you can apply to your Ubuntu. There are some good sites out there, but the best place is to look for themes at gnome-look.org gtk3 themes section. A nice theme I would recommend for starters is the "MediterraneanNight Series" by trastes as it has many themes that might suit as per needs of most of users. Though, gnome-look.org is the best place to get themes for Linux, but some honorable mentions include "DeviantArt" , it also has some great themes available. But it is not as easy as browsing in gnome-look.org and most of the themes that are available in DeviantArt are already available on gnome-look.org. But yeah, look out for that too. It is a great site after all. So now since you have got your theme and also installed Ubuntu Tweak, now you are all set up to install themes on your Ubuntu LTS. Step 1. Open up the "Home" folder in your file manager (Nautilus, by default). Step 2. On your keyboard press "Ctrl + H" to show up all the hidden files and folders. Step 3. Look for a folder named ".themes" and if it is not there then right click and create new folder and name it as ".themes"
Step 4. Open up the theme archive you have just downloaded and extract the folders in the ".themes" folder you have just created. Step 5. Now open "Ubuntu Tweak" and then open the "Tweaks" tab and then click on "Theme" option. Step 6. Change the "Gtk theme" and "Window Theme" to your desired theme. Note:- Not all themes comes with "Window Theme" . But most of the major themes comes with that. So, now you have changed your theme, you might find that the icons does not go well enough with the theme you have just installed. So to solve that you can change the icons in Ubuntu as well. To get icon themes I recommend having a look at gnome-look Icons Page . They have a lot of beautiful icon themes. Step 1. Create a folder named ".icons" in your home folder and copy the icon theme folders from the icon theme you have downloaded. Step 2. Open "Ubuntu Tweak" and go to Tweaks —> Theme —> Icon Theme . Step 3. Change the icon theme to the one you like. And then you are done changing your icons as well. To change fonts of your Ubuntu just open up "Ubuntu Tweak" and navigate to "Tweaks —> Fonts" and change the font to the one you like. You can get a tonne of fonts online. To install fonts just create a folder named ".fonts" in your home directory and just extract the fonts folder to that directory. Now since you have done all the necessary things you need to customize the look and feel. Why now go a bit further. So here are some other things that you can do to make yourself at home in Ubuntu. Who does not love transparency, I surely do, and to do that, open up terminal from dash or by hitting "Alt+Ctrl+T" and type in "sudo apt-get install gconf-editor" (without the quotes of course.) and then open it from the dash by searching for "gconf-editor" and then navigate to "apps —> gwd" and then change the "metacity_theme_opacity" and "metacity_theme_active_opacity" values to your liking. To change the width of launcher, right click on desktop and select "Change Desktop Background" and then it will open a window and at the very bottom there is an option as "Launcher Icon Size" slide it to change the width of the Launcher. To change Launcher transparency, open up Ubuntu Tweak and navigate to "Tweaks —> Unity" and then there are two options "Launcher Opacity" and "Panel Opacity" . Change the value using the slider and hence change the Opacity. If you are a guy coming from windows, you might find it annoying to go to the left top of the window to close when you are actually habitual to those buttons at right. There is a very easy way to do this. Open up "Ubuntu Tweak" and navigate to "Tweaks —> Window" and there you will find an option "Window control button position" change it from "Left" to "Right" or vice versa. So here was a basic guide on how to customize Ubuntu for a new person coming to Ubuntu who does not have that much knowledge about Linux. And it is also my first blog post ever, so thanks Lifehacker for that. So guys share how you like your Ubuntu desktop to be. 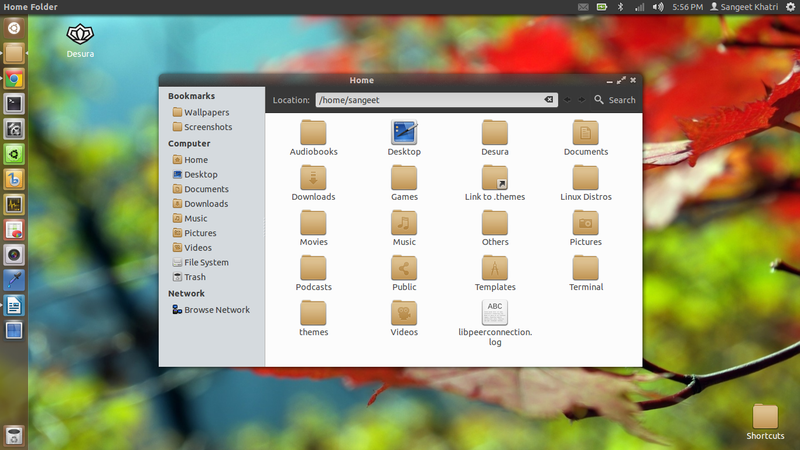 And what icon theme, Gtk theme and fonts you use. Also if you have any other tweak that you use a lot, then feel free to add that in the comments. Update: The part 2 of this tutorial has been made live at http://hackerspace.lifehacker.com/short-guide-to… , so check this one out after reading the first part for more customization.